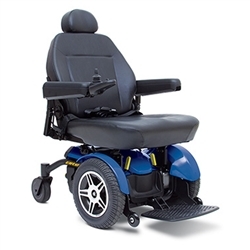 Simple main frame design for easy serviceability - Comfort high-back seat with headrest. Jazzy® Armor™ includes shroud and controller guards to protect from daily wear and tear. Quick n' Easy disassembly for convenient transport. In-line, front-wheel drive technology -40 amp, PG GC 3 controller. 6 wheels for added safety and support. 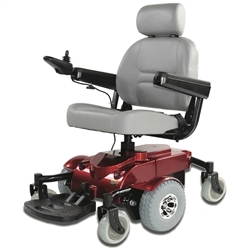 - Compact design maximizes maneuverability. Highly programmable controller. - Flat-free tires. Requires almost no maintenance and can be easily serviced. More stable and durable than the wobbly 3 wheel scooters. Lightweight at only 45 pounds (21 kilograms) with battery. It can be folded up to store conveniently in a car or SUV trunk. With width of just 22" this chair will fit through narrow doorways and aisles with ease. Fold-flat seat hinge for a compact fold - Weight capacity of 300 lbs. Desk-length flip-up armrests - Center-wheel drive. Dual-layer powder coated frame for increased durability. Side-mounted, easily accessible freewheel levers. 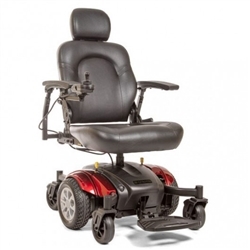 Convenient rear battery access - Indoor/Outdoor power wheelchair. Relaxing high-back seat with cushioned headrest. Black high-back seat with removable - Smooth, safe ride with the six-wheel design. Jazzy Armor includes shroud and controller guards to protect. 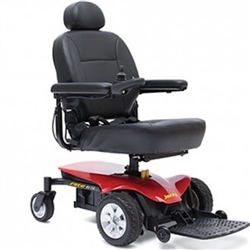 Full Size Powerchairs are controlled by a joystick which allows for easy maneuverability anywhere you go. 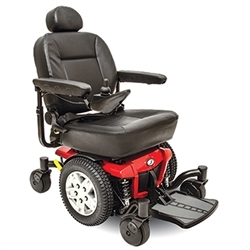 These Full Size Powerchairs are larger which allows for more comfort and stability.